It’s a single volume in the records of the United States District Court for the Southern District of New York. On the left hand inside cover is a copy of a letter dated 28 July 1919. It is from the Office of the Chief Examiner, Naturalization Service, U.S. Department of Labor, addressed to the Clerk of the U.S. District Court for the Southern District of New York. It was, then, a way for military veterans to get to become citizens faster and with fewer prerequisites and less paperwork than anyone else. So… did anybody actually take advantage of this law? With this kind of detail on an ancestor’s service, we can get a unit history and perhaps fill in some of the gaps despite the fire. Not to mention having the genealogical data that a naturalization document produces all by itself. A double win, in a thin volume of court records. 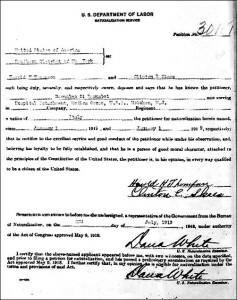 This is how my mother-in-law’s father obtained his citizenship. 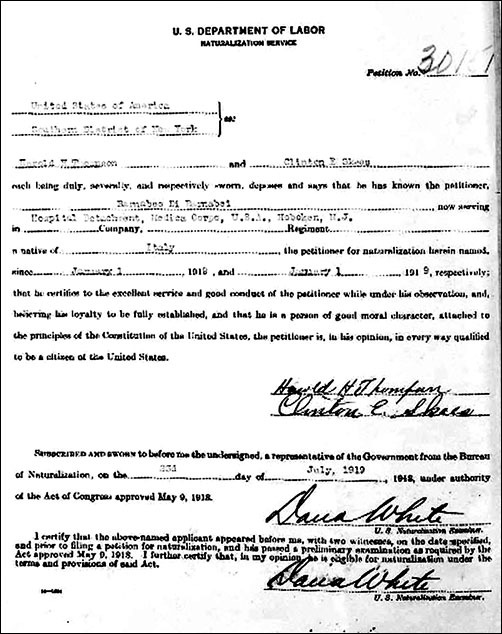 His papers were found at NARA in Waltham, MA.